Stunning 18th century map of Angers, France, in the heart of the Loire Valley wine region. Nouveau Plan de la Ville d'Angers enrichi de la carte des environs et de la perspective de la ville avec ses principalles maisons. Dressé par les soins de Messieurs les Maires et Echevins et Conseillers perpetuels de l'Hotel de Ville. 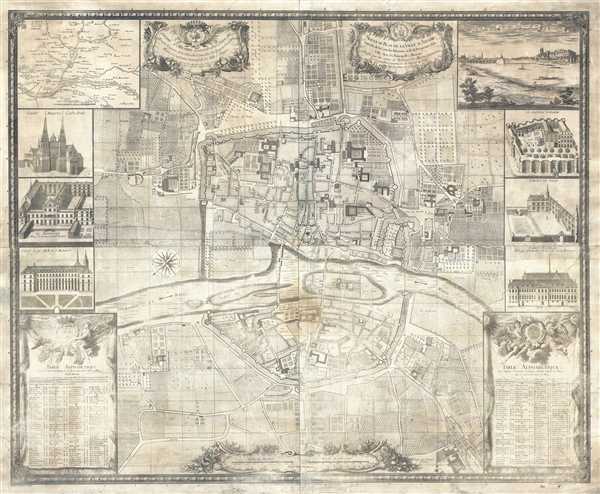 This is an 1882 Lachèse and Dolbeau restrike of a 1736 Simon map of Angers, France. The restrike was done using the original 7 plates, which were in the archives of the Mairie d'Angers (the Angers City Hall). The map centers on Angers and depicts the Maine River and the fields surrounding the city. The Maine River cuts through Angers, and the city appears to be walled and surrounded by a moat on both sides of the river. Several buildings, both inside and outside Angers, are labeled, including St. Maurice Cathedral (which is depicted in profile), several abbeys and monasteries, and the Hotel de Ville, another term for City Hall. The roads and town squares are labeled, and so is the Champ de Foire (fairground). The fields outside the city are depicted with different patterns and symbols to show the differences in crops. Framing the map are six depictions of buildings in Angers, including Saint Maurice Cathedral, the château d'Angers, the Hotel de Ville and three abbeys. A map of the environs of Angers occupies the upper left corner and depicts the confluence of the Maine River and the Loire River just outside the city. A view of the city from slightly upriver sits in the upper right corner. At the bottom left corner is a table of the streets of Angers in alphabetical order, so that they can easily be located, and at the bottom right corner is a table of 'churches, convents, schools, mansions, palaces, and squares' also in alphabetical order. Two elaborate cartouches are situated along the upper margin. The one on the right is the title cartouche, and the one of the left bears the dedication by the author, Simon. Along the bottom margin, the scale can also be found in an elaborate cartouche. This example of this map was published by Lachèse and Dolbeau in 1882 in Angers, France. The original was drawn by L. Simon and engraved by N. Baillieul and G. Dheulland in 1736 in Angers. Very good. Printed in 7 panels joined by publisher. Professionally restored and backed on archival linen.